The company I run, Clearbit, is only 60 people. This system may break down at larger company sizes (we will see). Also you’ll notice that sometimes we’re forcing Asana to do things it wasn’t quite built to do. This works for us, but perhaps someday someone will write a dedicated tool. 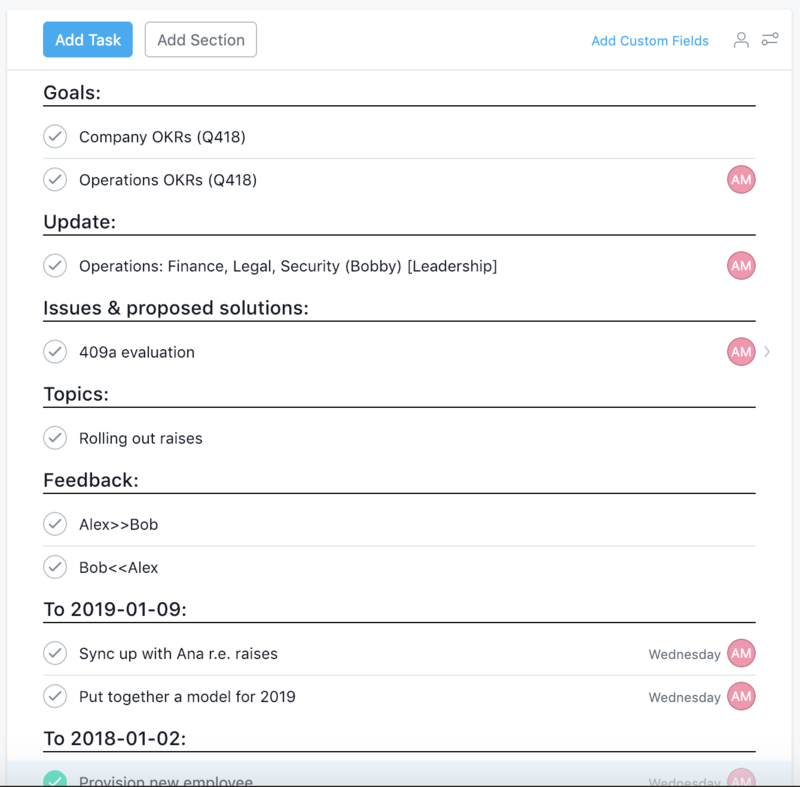 Lastly, this system is probably possible with other task management systems, I’m just a particular fan of Asana. On any given day inside your company, dozens of agreements are being made between employees. If these agreements are not recorded in one place, there’s very little accountability and you’ll find many slip through the cracks. This is straightforward to do in Asana, and has the added advantage that anyone can look at all their upcoming tasks / agreements by due-date. Agreements made solely with yourself (i.e. which have no dependencies) should be recorded elsewhere. One-on-ones are the heartbeat of Clearbit, a weekly scheduled safe place for every employee where information is disseminated, feedback heard, and issues discussed. I’ve found tinkering with the format of this meeting one of the best ways of improving information sharing and feedback loops. Since every manager is trained in how to effectively conduct one-on-ones, and it’s a core requirement of their job, any changes made will instantly be implemented across your organization. When the company was founded we had no need for one-on-ones; we were all in the same room, an arm’s length way away from each other. We started doing regular one-on-ones at around 15 employees, but without any structure. Then at 25 people we added the structure you see below. This process may seem excessive, and is indeed a headache to set up, but once everyone’s onboard it runs incredibly smoothly. Personally I do all my weekly one-on-ones Wednesday morning, and then run the Leadership meeting in the afternoon. That way I’m up-to-date with the state of the company by the Leadership meeting. These are tasks listing the company’s OKRs, the department’s OKRs, and the individual’s OKRs. Ideally most of the tasks on an individual’s Todo list are related to making progress on their OKRs. Creating good OKRs is outside the scope of this article, but there’s a great chapter on them in the Great CEO Within. We traffic light all of ours, and ask people to update their OKR traffic light status as part of their one-on-one. The update should be written up prior to the one-on-one and then silently read by the manager at the start of the meeting. This gets the manager up to speed quickly on the weeks progress. 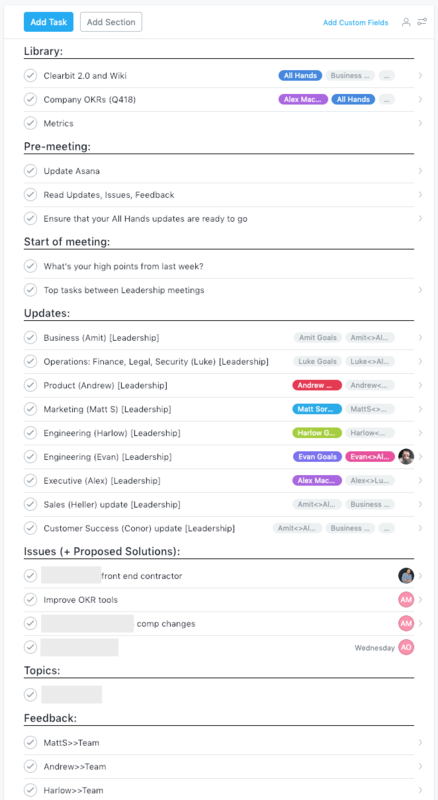 For execs, this update should be a shared task also residing in the Leadership meeting project (more on this later), so the rest of the Leadership team can read the updates prior to the Leadership meeting. These are a list of any issues that an individual wishes to bring up with her manager. They all need to have an owner, a good description detailing the issue, and ideally a proposed solution. As with the update, it’s best to just read the issue’s description rather than having people verbally recant it (faster data transfer). These are a list of open-ended discussion topics and should encompass the majority of the meeting. Any action items created during the meeting should be recorded below in the dated section. The date references the date of the next one-on-one meeting. As with all Impeccable Agreements, each task needs an owner & due date. Ideally, by the time the one-on-one rolls around, all the tasks assigned during the previous one-on-one are completed. For tasks that remain uncompleted week-to-week, duplicate them so you can see tasks are lingering. Managers should ask their subordinates to write a habit by each uncompleted task detailing how they will ensure this doesn’t happen again. Once you’ve finished giving each other feedback, read through your feedback with curiosity, accept or reject any critical feedback, and create appropriate action items. We do biweekly leadership meetings to sync up the exec team, discuss issues and make decisions. And guess what - we run it out of Asana! Every regular meeting at Clearbit has a similar structure and Asana project, you get the gist. We each take turns and talk about the favorite part of our last week. It doesn’t necessarily need to be about work either, just something we enjoyed. As with the one-on-ones, we silently go through every department’s updates and read them. This is a huge amount of information transfer in the first ten minutes of the meeting, and ensures everyone is synchronized. Prior to the meeting issues are created. Each issue must have an owner, good description, and ideally a proposed solution. We time-box each issue, and use an alarm to ensure that we don’t spend more than five minutes per issue. We’re aiming to get the issues out the way to spend more time on free-form discussion. These are general topics of discussion that aren’t necessarily actionable. We find having some open-ended topics the most fruitful when it comes to coming up with new ideas. As in our one-on-ones we finish the meeting with a round of feedback. For time reasons we can’t do 180 feedback, but we usually just give feedback to whoever’s on our left. We use a fairly standard kanban system for engineering task scheduling, with a backlog, next up, current, in review, and shipped columns. Every two weeks we prioritize tasks from the backlog and stick them in next up column. As with all of our tasks, every engineering task needs an owner, due date & extensive description. We will often include an owner from the business side on the task in case engineers have any questions. Although this process may seem onerous and bureaucratic you’ll find that, in practice once implemented, it fades into the background and is an excellent framework for running and scaling your company. It gives everyone the structure, feedback, and accountability they need while also providing space for more creative discussions. Meetings are very expensive; they should be run with intention and focus. The best part is that it can be run remotely and, when required, asynchronously. Today, a third of Clearbit’s employees are globally distributed, and we use this process to stay in sync and up-to-date.